Martin C. Gutzwiller was a Researcher at Thomas J. Watson Research Center for International Business Machines Corporation (IBM) (1960-2014). Other institutional affiliations included Shell Oil Company. His research interests included complex systems and quantum theory. October 12, 1925Birth, Basel (Switzerland). 1950Obtained Diploma, Eidgenössische Technische Hochschule, Zurich, Zurich (Switzerland). 1950 – 1951Engineer in Microwave Transmission, Brown-Boveri, Baden. 1953Obtained PhD in Physics, University of Kansas, Lawrence (Kan.). 1953 – 1960Physicist, Exploration and Production Research Laboratory, Shell Oil Company. 1960 – 1963Physicist, Research Division, International Business Machines Corporation (IBM), Zurich. 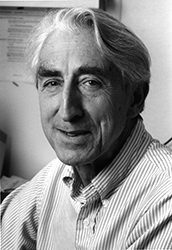 1963 – 1993Adjunct Professor of Physics, Columbia University. 1963 – 2014Researcher, Thomas J. Watson Research Center (1963-1993); Director, General Sciences Department (1974-1977); and Researcher Emeritus (1993-2014), International Business Machines Corporation (IBM), Armonk (N.Y.). 1973 – 1974Visiting Profesor, Eidgenossische Technische Hochschule, Zurich. 1986Visiting Professor, University of Paris, Orsay. 1987 – 1993Vice-Chair, Committee on Mathematical Physics, International Union of Pure and Applied Physics. 1992Member, National Academy of Sciences. 1993Fellow, American Academy of Arts and Sciences. 1993Awarded Dannie Heineman Prize for Mathematical Physics, American Physical Society. 1993 – 2014Adjunct Professor of Physics, Yale University. March 3, 2014Death, Rio Rancho (N.M.). Advised by Gutzwiller at University of Kansas. Obtained Diploma and Visiting Professor. Received 1993 Dannie Heineman Prize for Mathematical Physics. Vice-Chair, Committee on Mathematical Physics. Obtained PhD in Physics (1953). Chaos in classical and quantum mechanics / Martin C. Gutzwiller. The interplay between classical and quantum mechanics / edited by Martin C. Gutzwiller. Martin Charles Gutzwiller Physics Today obituary.